The 26-year old African American-owned company provides chemical product and management services to customers in a range of industries including automotive, aerospace, heavy manufacturing, defense and biopharmaceuticals. 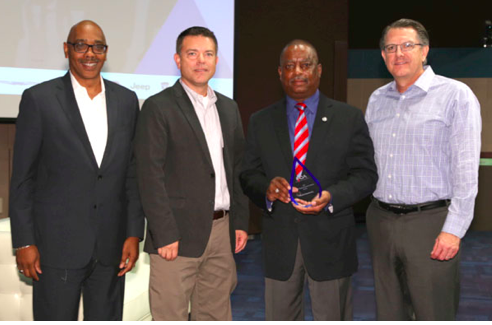 FCA US awarded the honor to Chemico Systems during its 16th annual Matchmaker event on September 17 at FCA’s Auburn Hills (Mich.) headquarters. The Matchmaker event provides minority-, women- and veteran-owned suppliers an opportunity to network with FCA US Tier 1 suppliers and its own decision makers in the procurement process. FCA US supplier diversity goals require that 11.5 percent of a Tier 1 supplier’s procurement buy be sourced to certified minority suppliers. The goal for women-owned suppliers is 3 percent. FCA US itself spent $2.6 billion with approximately 200 minority suppliers in 2014, representing 7.2 percent of the company’s total annual purchasing. Since 1983, FCA has purchased nearly $53 billion from minority-owned suppliers. About Chemico Systems: Chemico Systems, Inc. specializes in chemicals that are used in a variety of industries – manufacturing, health care, hospitality, and education. Founded in 1989, Chemico Systems has two distinct lines of business, Specialty Chemicals and Industrial Paint and Rust Removal. Chemico Systems is a part of the Chemico Group, which operates more than 50 sites throughout the U.S., Canada and Mexico. Chemico customers include General Motors, Fiat Chrysler Automobiles, Ford, Toyota, Amgen, Delphi, Honeywell CR Bard and Maxion Wheels Mexico. For more information, visit www.chemicosystems.com.